Most things in our house are recycled. Our furniture is Vintage Attic, via yard sales and junk piles. Most of our clothes come from Sally's Boutique (aka the thrift shop) or are hand-me-downs. We've done this through necessity, but it's also a way of life for us: re-using things that still have a lot of good life in them, and not adding to the stream of things that get tossed out, as well as not perpetuating the endless river of the making and consuming of goods. As much as we can. So, anyway, recycling is one of the things I try to promote in my life and my livelihood. One way is by recycling sweaters that folks give me or that I buy at Sally's. 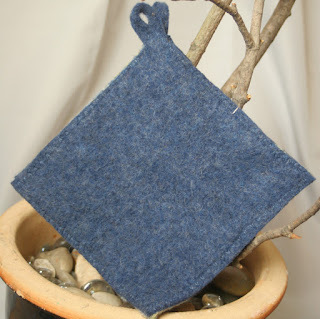 The method: take a wool sweater, shrink it in the washer (the process is called "fulling"), cut it up and make new things out of it. 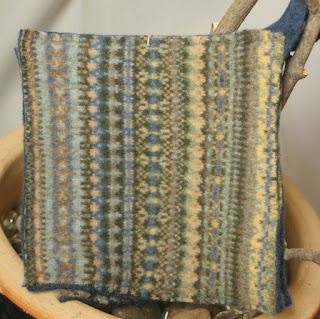 One of the most popular things I make is wool potholders. If you use good, thick sweaters, they work really well and you don't feel any heat coming through them. They last a long time, too.